I was chatting with Chad from Akari Dojo this weekend and I brought up an incident that interests me. In my club, we teach judo tachiwaza trying to end every throw that we can with ukigatame (floating hold - a.k.a. knee-on-belly). Then we begin our newaza instruction in ukigatame - so the knee-on-belly is basically our most favorite transition from standing into groundwork. Chad didn't think that was all that interesting. "Doesn't everyone do that?" Apparently not - I was at a seminar some time back and there was a call for the instructors to show some transitions between standing and groundwork. "OK, I thought, this is going to be a nice, short session on ukigatame." But the first instructor got up and showed (If I remember right) standing wakigatame transitioning into the ground. "Cool," I thought. I'd seen that before but we don't do it much. Then the next instructor got up and showed something else (IIRC kouchi passing the legs as uke falls). "Interesting. I'm sure ukigatame is coming soon." Instructor after instructor got up and demonstrated different entries into groundwork and none were ukigatame. 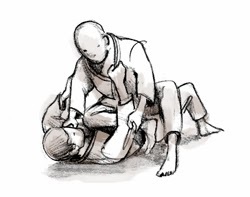 Well, some time later I wrote a blog post on ukigatame and how we use it as sort of a universal joint between a standing and a grounded judoka. 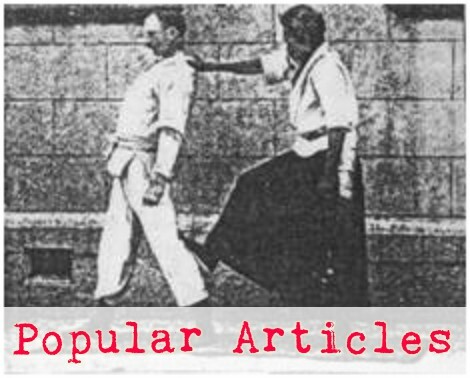 Some real olde-timey judoka with plenty of experience commented, "What the hell is ukigatame?" and when I explained that it is the old knee-on-belly thing they said, Yeah, I'd seen that, but we don't do it much." I'm not trying to say one or the other groups does something wrong - what is interesting to me is this suggests a couple of separate lineages (ryuha) passing judo knowledge down through the generations. My first instructor (and Chad's) was adamant that we end everything in ukigatame. Presumably that instructor got that practice from one of his instructors... But this other group doesn't do that, and neither did their common instructor, and presumably neither did that teacher's teachers. It sorta suggests that at some time in the past, some prominent instructor started using ukigatame to great effect, and passed that down through his students to their students and through my teacher to me and Chad, while other prominent teachers passed other stuff down through the generations. So, ukigatame seems to be an example of the division of judo knowledge into different streams of thought (ryu or ryuha). Wouldn't it be interesting if we could trace the streams of thought of the major instructors down through the generations from Kano et al. to today, so we could determine what ideas were added or lost and when and by whom and under what circumstances? Judo really has a lot of streams, and the only consistent theme is what works in competition, which I'm not interested in because competition is a hot house atmosphere. 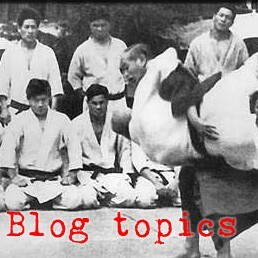 The biggest sub-stream within judo comes out of the Kosen School league which focused on newaza (see http://www.budogu.com/SearchResults.asp?Search=kosen&Search.x=0&Search.y=0　for examples). After that it gets interesting, with each teacher showing what he preferred. On top of this, many of the early teachers were also skilled in other jujutsu schools, so they may have brought their particular flavor to their teaching. What might be interesting is for you to build your lineage back to the pre-war days and see what influences your particular line had. I started not too long after Chad, but there was little to no emphasis on ukigatame as an end. It almost always went to more traditional pins, either kesa or yoko shiho. you don't recall an emphasis on being upright directly over uke as he falls and putting a knee against him to hold him still for a moment before shifting into kesa or yoko? the intent was one complete transition from throw to ground. interesting. Thanks for adding the different perspective. As I recall, we played some with going directly into the ground from a throw - mostly when we were explicitly working on tournament judo context - but our normal practice mode was throw-then kneel on uke while you decide to go to the ground or not.